Diabetes and how you cope with it is an ongoing exploration. Recently, I’ve been experimenting with pulses such as lentils, and beans (kidney and butter) and even (shock, horror) whole grains such as barley. I find their effect on my blood sugar minimal, and I love the variety they add to my diet. I was vegetarian for a long time, and lentils were a favourite food – lentil curries, patties and stews, all delicious. Keto proponents don’t approve of lentils and beans because such diets promote extremely low carb intakes as sub 50g, but if you aim for a more moderate carbohydrate intake, such as 90-150g a day, you can easily add in pulses and beans. Remember too, that they have a high fibre content and you’ll probably be able to subtract that from the carbohydrate total when you work out how much insulin you need to cover a meal. Apart from adding variety to my diet, I’ve also gone back to pulses and beans because of their fibre content. A lot of nutritional research these days points towards the importance of fibre, and it’s difficult to get much fibre on an extremely low-carb diet. My body seems like the pulses and beans, and my blood sugar results confirm this. If your diet opens up and allows you more variety, this is always a good thing. So, to celebrate here’s my recipe for hummus. Hummus is high in fibre and relatively low-carb. Used as a dip or sauce, you’ll only be adding minimal carbs to your diet. Now, one thing I tried with this is the peeling the skins off thing. I’d read about this online, that if you want velvety-smooth hummus, you need to peel the chickpeas. U-huh. I wouldn’t do this every time as it’s possibly the most tedious job in the world, but for a special occasion, absolutely. You get beautifully smooth hummus. Drain the chickpeas, reserving two tablespoons of the water. Peel the skins off. The easiest way to do this is to pinch each chickpea between your thumb and finger, and it should pop out of its skin. Do this above a bowl and be prepared for a few to ping across the room. Pop into a food processor, along with the garlic and reserved water and whizz for a minute or so. You can also use a stick blender, but this is the less messy method. Add the lemon juice and tahini and whizz again, for a couple of minutes, so you get a smooth, creamy texture. Add salt to taste – about ½ to one teaspoon. Use as a dip, spread on your favourite low-carb bread. It’s also lovely spread on lamb steaks. Total carbs – 24g, minus 11g for the fibre. Purple foods are good for us. According to the US Department of Agriculture, purple foods have nutrients called anthocyanins. These are antioxidants that protect against cell damage from free radicals. I’m a big fan of the mighty aubergine. 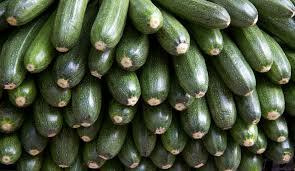 Curry it, roast it, grill it or turn it into ratatouille, this is a vegetable with a lot of uses. 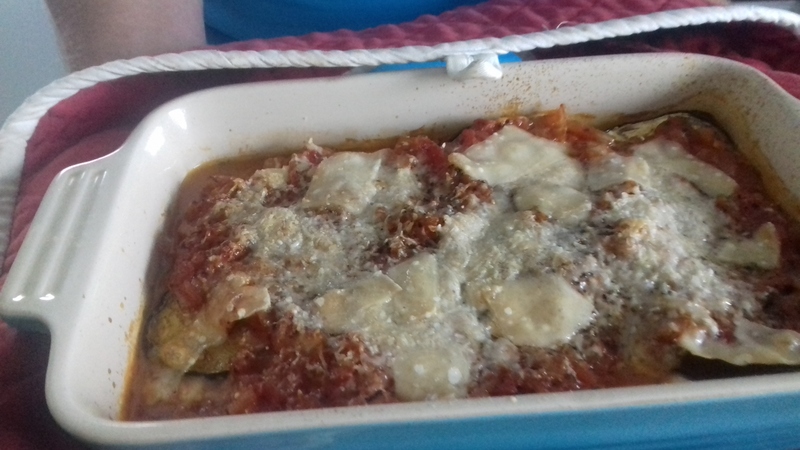 I make my own version of Aubergine Parmigiana, that famous Italian dish. Buy the best quality mozzarella you can find, and top the dish lavishly with grated Parmesan cheese. Serve this as a side dish with roasted chicken. Or just cut yourself a ginormous portion and eat with salad. Turn your oven to 175 degrees C. Slice the aubergine into half-centimetre thick slices. Drizzle with one tablespoon of the oil and cook in the oven for about twenty minutes. You want the slices softened and lightly browned. Leave the oven on once the slices have cooked as you will be using it again. While the aubergine is cooking, heat the other tablespoon of oil in a saucepan and cook the sliced onion for five minutes until softened but not browned. Add the tomatoes, garlic and dried oregano. Bring to a boil, turn down to a simmer and leave for fifteen minutes. You want a thick, concentrated sauce. When the sauce and the aubergine are cooked, rip the mozzarella ball into pieces. Layer up slices of aubergine, tomato sauce and mozzarella in a casserole dish. Grind on some salt and top with the grated Parmesan and a generous helping of pepper. Cook in the oven to heat through and brown the top – about ten to fifteen minutes. *The cheese so good, Pepys buried a round of it in his garden during the Great Fire of London.